Unlike last year, when surveyors like Bob Peeler recorded homeless residents' answers on paper, this year the city is upgrading to a smartphone app. On a cold day last January, an outreach team had just left from the Crosswalk teen homeless shelter, ready to conduct the same mission the city of Spokane has every year: Find homeless community members and ask them a battery of questions like "Where did you stay last night?" and "What caused your homelessness?" Done right, the federally mandated annual point-in-time count can give a vital sense of the scope and nature of homelessness in Spokane. But several aspects of the count were frustrating. There was a sense that there were a lot of homeless people out there who were inevitably being missed. In particular, the winter seemed like a terrible time to be looking for homeless kids. "It doesn't feel like an authentic template for getting actual numbers, for me," Courtney Lehman, an outreach team member, said at the time. "If you really, really want to address this problem, you're going to design an outreach program in a way you reach the most people." With the next homeless count approaching at the end of January, that's exactly what the city has tried to do. Staffers have spent the last few months radically reinventing the way Spokane tallies the homeless. More volunteers will be sent out countywide. Youth events will be held in order to bring homeless kids to a place they can be counted. And by using a smartphone app specifically designed to conduct a point-in-time count, the city hopes to not only get better data — but save so much time and money it can afford to do a count in the summer as well. They're calling it "Everybody Counts." With a new homeless-count app, the city will be able to shift where outreach teams are being deployed. David Lewis, manager of the city of Spokane's homeless data system, fidgets with excitement as he raves about how doing a better job of collecting information could alter the course of homeless people's lives. "There's this sense of seeing numbers, crunching numbers, doing the analysis, wanting to see where the trends are going, wanting to do more," Lewis says. "Knowing that this data we're collecting — it means something. It can better people's lives and lead to solutions." 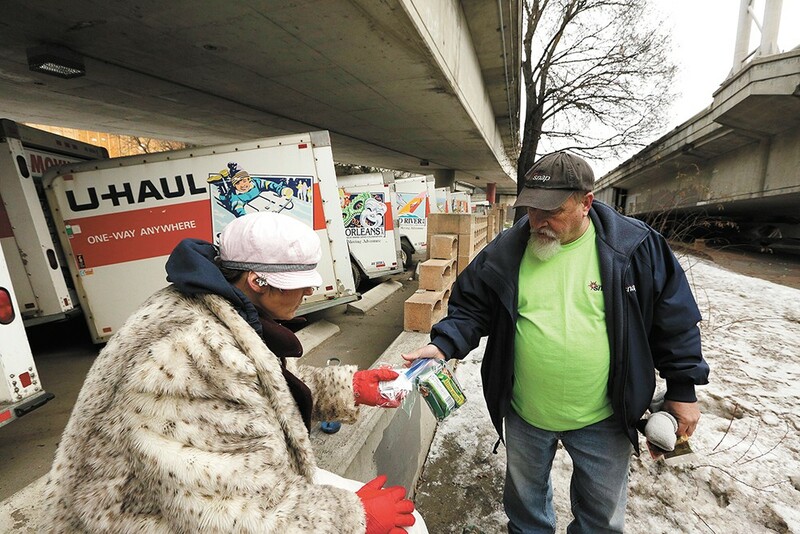 The annual count isn't just about tallying stats about how many homeless people are in Spokane. It's a tool to build personal profiles, a sort of passport that follows a person from agency to agency — from, say, Frontier Behavioral Health to Catholic Charities to the Salvation Army. At its best, the system can help social services find exactly what each Spokane resident needs to escape homelessness. Last time, Lewis says, the city had around 20 volunteers who weren't a part of social service agencies helping with the count. This time they've already recruited at least 75. And this time, they won't be just targeting downtown Spokane. "We'll be collecting data in Cheney, Airway Heights, Spokane Valley, Mead, Deer Park," Lewis says. "We'll be able to reach further than we ever have before." Crucially, the city is largely doing away with the piles of blue paper forms that volunteers manually fill out. Want to count the homeless? There's an app for that. First piloted in a small town in Massachusetts in 2013, Simtech Solutions, Inc.'s Counting Us app allows volunteers to use their smartphone to fill out the survey directly in the field. It's been adopted by the states of Connecticut, South Dakota and Rhode Island, and cities like Houston, Fort Worth and Dallas. All each volunteer has to do is download the app, tap in a code provided by the city, and they're connected with the city's questionnaire. Most volunteers will use their smartphones. For those who don't, the city's providing digital tablets, purchased using a grant from the Walmart Foundation. In Spokane, the strategy fits snugly into the Condon administration's goal of slashing inefficiencies, tracking performances using data and finding unconventional solutions. It used to take weeks and weeks for the city staffers to manually enter the count forms into a computer. A single survey could take 15 minutes to enter in, as staffers struggle to decipher volunteer handwriting to enter the info into the system. Now, the moment each survey is completed, the information's sent electronically to the city's database. Meanwhile, Lewis will be back at the city's command center, able to see a dot pop up on the monitor with the exact location that the survey was taken — crucial to understanding where homelessness is the most concentrated in the community. In real time, they'll be able to see the answers coming in. If something looks odd with the information or if they spot that a volunteer's making a mistake, the team can call the person immediately to address the problem. Like generals deploying their forces, they can spot areas that the outreach teams may be missing, and redirect their troops to the gap. And all of this year's data will be used to make next year's count even more effective. "The power of this is not only going to be the first year it's done. Or even the second year. It's going to be the third year," Lewis says. "Future planning, future counts." This year, the city is trying to focus on one undercounted population in particular: kids. A $40,000 study in 2015 from Priority Spokane found that youth homelessness was 33 percent higher in Spokane than the rest of the state. Local social service agencies have made fixing youth homelessness a priority. Federal law requires the homeless count to be done in the last 10 days of January. But homeless camps — and even shelters — can feel particularly dangerous for youth, and when it gets cold, kids are more likely to double up with their friends than stay on the streets. Bridget Cannon, who runs the Crosswalk teen shelter with Volunteers of America, says many kids are reluctant to trust a stranger with a clipboard who starts asking questions. "They think someone is going to contact the parent, CPS, or the police and they'll be arrested or returned to an unsafe home or end up in foster care," says Cannon. So instead of merely wandering the streets to find homeless kids, the city's seeking ways to bring homeless kids — and their friends — to them. During the week of the annual count, several "magnet events" will be held throughout the city. On Jan. 26, the Downtown Library will hold a virtual reality gaming event from 2 pm to 5 pm, where homeless kids will be given the homeless-count survey. In the following days, similar events will be held at the Shadle, Hillyard and Eastside libraries and at Opportunity Presbyterian Church. These events aren't just about gathering stats, Lewis stresses. They're also about providing crucial information to kids about the sort of social services that are available to help their homeless friends out. "My hope would be that they're not scared or intimidated," says Tija Danzig, the city's homeless services program manager. "We want to open it up and make it more inviting, so if a youth needed the support they wouldn't be afraid to ask for it." No matter how the homeless count is conducted, there are inherent flaws with only having one a year. On any given day, a tastier meal option at a homeless shelter may artificially inflate the count, while, say, extra downtown security for an ice skating competition can artificially deflate it. Winter is a better time for counting people in shelters. Summer is a better time for counting youth. "Really, if you want an accurate reflection, you would do multiple counts," says Cannon. "But I know it's expensive." And Lewis says the city is considering doing just that: Adding a second count in the summer. Right now, Jonathan Mallahan, the city of Spokane's outgoing director of neighborhood and business services, says there's no official commitment from the city for doing a second count. But he says the city should find a way. "I think that it's an absolute necessity," says Mallahan. Lewis is optimistic it will happen. 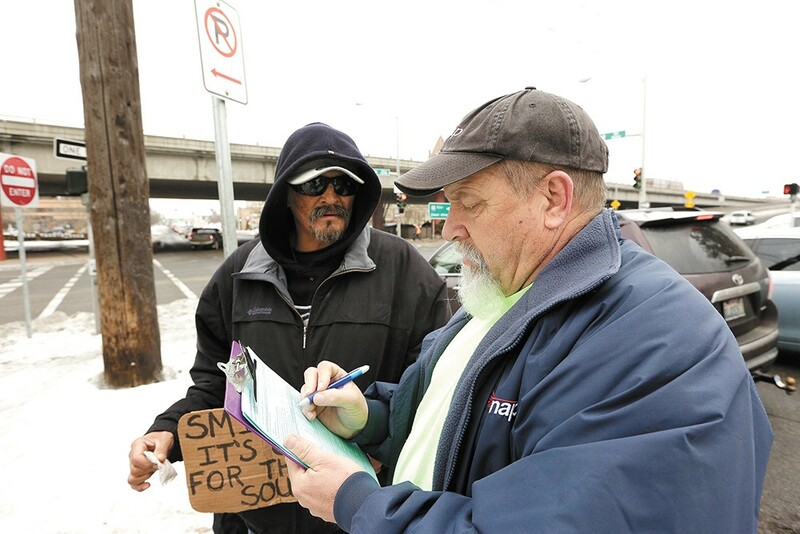 Among both city officials and social providers there's the sense that homelessness really is on the increase, both in Spokane and the rest of the Northwest. More homeless camps are popping up. More people are packing into shelters. Housing availability is at rock bottom levels. EDITOR'S NOTE: The print version of this story had an incorrect name for Simtech Solutions' app. It has been corrected here. The original print version of this article was headlined "Counting It All"